It’s been two days since my camping trip to a nearby island ended. I expected a welcoming party when I got to Yttervik, but everyone is gone. Cars have been abandoned on the road. Food was left on the kitchen table and front doors are wide open. After searching an abandoned police car, I found a gun in the trunk. Luckily, I made it to the church in Iboholmen after an encounter with odd robots. Surprisingly, the pistol from the cop car was effective against them. A note was left in the church saying that everyone has gone to Salthamn a mile up the road. I hope everyone is okay. 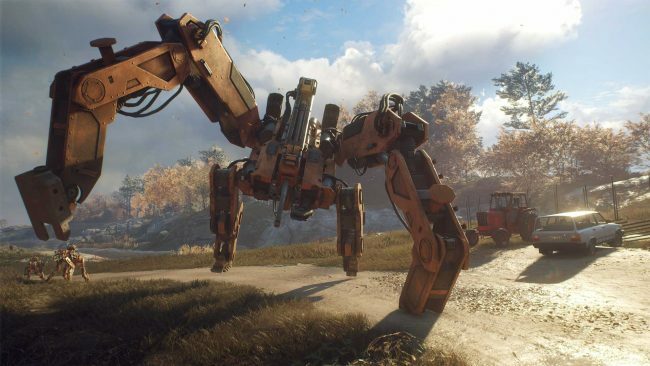 Avalanche Studios took its love of the 1980s and Sweden and wove it into Generation Zero‘s story, which is told through handwritten notes, recorded messages on the answering machine, and military plans found in underground bunkers. English subtitles are used for the answering machine messages, which are in Swedish. The locations on your map are Swedish. Posters on buildings declaring that the Berlin Wall has fallen are also in Swedish with English subtitles. Generation Zero is a tale of two games. If you are playing solo, you’ll be spending most of your time sneaking around or running away from killer robots. Having spent most of my time playing this game alone, I’d define my time as horrifying, as I spent much of it exploring abandoned bunkers, empty houses, and barns, then throwing flares or fireworks to distract enemies so I could avoid fighting and progress to the next town. As a solo player, you very rarely want to get in big firefights, so you can stay alive. Though death is only a minor hindrance, provided you have acquired an adrenaline shot that can revive you. 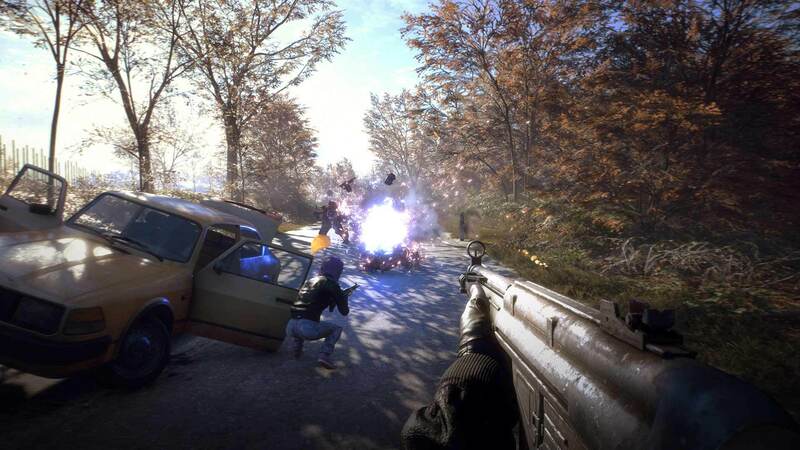 Adrenaline shots are easy to come by, but if you run out, then you’ll be revived at a nearby safe house. You never lose items or experience, which means you aren’t penalized for dying. Cooperative play is where Generation Zero stands out, provided you have a coordinated group that uses voice chat. If you can plan your strategy, share resources, and use MMO raiding roles, you may find success. Playing solo, you may feel overwhelmed with everything attacking you. With a team, you can pick off smaller robots and use houses and trees to block incoming fire. The biggest negative to playing in multiplayer is that if you aren’t the host, progress is not saved. Progress is only saved locally if you are in the host’s game when the mission is started, and you have previously completely the necessary prerequisite mission. At the outset of the game, you create your character and his/her style. You get to choose from a selection of rad 80s styles, such as the punk, metalhead, jock, and the nerd. Later on, you’ll collect cosmetic gear that will make you more resistant to bullets, fire, and explosions. 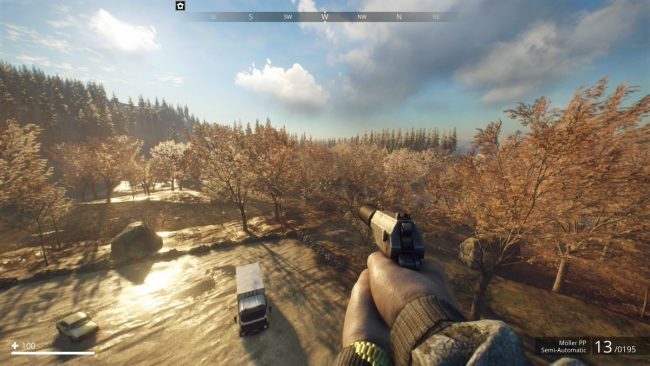 Generation Zero also has light RPG mechanics, such as a skill tree. Leveling up takes a while, compared to modern games, so people need to spend their points wisely. If you’ve played games such as Fallout, Far Cry, and DayZ, you’ll be quite used to the loot system. Searching through backpacks, toolboxes, and cars will produce ammo, gas tanks, and health packs. The gas tanks can be used as a trap. People just need to lure the robot close to one, then shoot it to do massive damage. (The gas tanks are red, after all.) While scavenging for supplies, you’ll come across items that are meant to distract the robots. Flares, fireworks, and radios can be used to lure the robots to a place you filled with traps, so you can more easily dispose of them. Above all, I enjoyed my time with Generation Zero. In 2019, no online game is ever truly done, so I expect Avalanche Studios to put a lot of work into improving the game. The gameplay loop of loot, shoot, and run all feels good, and I’d like to see more story added to the game. Also, it would be great if there were more machines, more weapons, and proper difficulty scaling for players who want to play by themselves. Above all, the world is just too big. The only way to get around is to walk, and most of the time is spent crouch walking to avoid detection. I’d recommend Generation Zero to those who have a steady group of friends to play with. If not, stay away until the game goes on sale or a major patch releases that makes the single player option more manageable. I like you, Generation Zero. I just wanted better. Generation Zero review code provided by publisher. Version 1.01 reviewed on a PS4 Pro. For more information on scoring please see our Review Policy here.